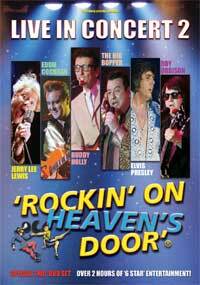 For 4 nights (29th Jan - 2nd Feb) the Ilfracombe House Hotel had some special guests - the look-a-likes of 'Elvis' , 'Roy Orbison', 'Big Bopper', 'Eddie Cochran', 'Budy Holly' and 'Jerry Lee Lewis' from the 'Rockin on Heaven's Door' group. The Top Billing Managment choosed the Ilfracombe Hotel as their host when they performed live at The Palace Theatre in Westcliff last week. The line-up of the artists consisted of Steve Halliday (Eddie Cochran), Dave Wickenden (Buddy Holly), Barry Steele (Roy Orbison), J S Rawlings (The Big Bopper), Richard Atkins (Elvis Presley) not forgetting guest star, Jerry Lee Lewis (Darren Green) with his amazing ‘flaming’ piano. I was invited to watch the show by Diane and Brian - the producers, and, it was a great night & an excellent show to watch. If you funcy watching any of the 'Rockin on heaven's door' group shows please check out the tour dates here.